The Alumni Association Board of Directors and active chapter leadership are working together to plan the sesquicentennial celebration for the Michigan Alpha chapter. The 150th anniversary will occur on November 28, 2014, but the milestone will be celebrated in conjunction with the Homecoming football weekend that starts on October 31. During the fall, the Alumni Association sent a survey to all Michigan Alpha alums to obtain feedback about the sesquicentennial celebration and other topics. The response of alums indicates that there is significant interest in attending an event to mark the 150th anniversary. Given that alumni attendance for the Homecoming event hosted by the Alumni Association and active chapter has been steadily increasing during recent years, we believe that it makes most sense to combine the sesquicentennial celebration with this popular annual event. The draft plan is to host a semi-formal attire dinner to celebrate the sesquicentennial on the Friday night of Homecoming at a campus venue such of the Michigan League or Michigan Union. On Saturday, an open house at 1437 Washtenaw would be held before the kickoff for the Wolverines vs. Indiana football game. Saturday night would be left open for individual classes, or more likely eras, to hold their own reunions in town. The final event would be a brunch and brief ceremony at the chapter house to send Michigan Alpha off in good stead toward the 175th anniversary in 2039. The Alumni Association is planning meet with the active chapter leadership in coming months to finalize the itinerary for the sesquicentennial celebration. 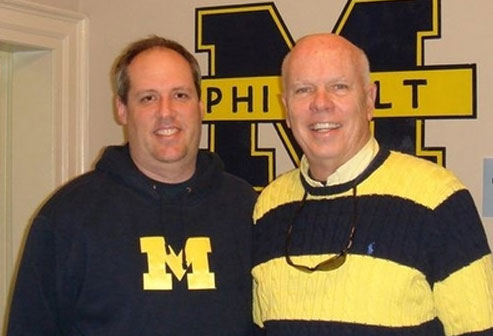 In addition to events, the Alumni Association is planning to publish an all-time membership directory that would include the roster of every man who has signed the Bond of Phi Delta Theta. We would also like to include in the directory a historical timeline with pictures of the chapter. If you have memories or pictures that could be included in the directory, please contact the Alumni Association. The initial itinerary for the sesquicentennial celebration is similar to how Michigan Alpha marked its 100th anniversary in 1964. We recently found pictures of the chapter's centennial celebration in the archives of the General Headquarters that are posted on our web site. If you can identify the men in the pictures, please let us know.